Testicular cancer symptoms can be similar to other conditions that affect the testicles, such as infections. A lump or swelling in part of one testicle is the most common symptom of a testicular cancer. It can be as small as a pea but may be much larger. You may notice an unusual difference between one testicle and the other. Most testicular lumps are not cancer. Your scrotum may feel heavy. Testicular cancer is not usually painful. But the first symptom for some men is a sharp pain in the testicle or scrotum. This happens in about 1 in 5 men (20%). 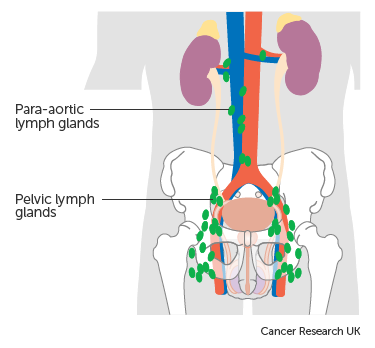 Sometimes testicular cancer cells can spread into lymph glands at the back of the tummy (abdomen). This can cause backache or a dull ache in the lower tummy. Your doctor may call these lymph glands the para aortic or retro peritoneal lymph glands. Less often testicular cancer spreads into lymph glands lower down, such as the pelvic lymph glands. Sometimes testicular cancer spreads to the lungs. It rarely spreads to other organs in the body. If it has spread to the lungs you may have a cough or feel breathless. Many testicular cancers make hormones that can be detected in blood tests. Occasionally, men with testicular cancer have tender or swollen breasts because of these hormones. Your symptoms are unlikely to be cancer but it's important to get them checked by a doctor.